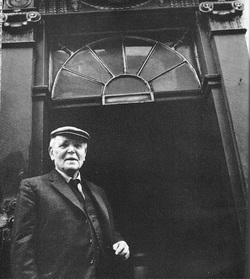 Stephen Graham spent his final years at Frith Street. He and Vera travelled abroad a fair amount - mainly to Yugoslavia - where they stayed with some of Vera's relatives on the shore of the Adriatic. They also regularly went to the Scilly Isles in the summer. In 1967 - after almost fifty years - Stephen returned to the United States (this time with Vera). He went to Tallahassee to visit an old friend, as well as Texas, where he visited the Harry Ransom Centre in Austin which had bought some of his manuscripts a couple of years earlier. Graham continued to review books regularly, as well as writing his own, but few publishers were interested in his work. Collins did however bring out his autobiography Part of the Wonderful Scene in 1964. The biography focuses overwhelmingly on the first half of Stephen's life. It is also extremely discrete. The book nevertheless chronicled the astonishing array of people Stephen had met in his long life. The draft versions show that Stephen spent a great deal of time on his autobiography, working hard to tell the story of his life in a way that would not cause offence to any one still living. During his final years at Frith Street, Graham's health became worse. His private diaries show that he began to return more and more to the ideas of his youth. He read a great deal of religious literature and spent a lot of time ruminating on 'idealism'. Some of those who knew him in old age remember him as an increasingly remote figure, and perhaps a rather sad one, who felt increasingly estranged from the world he lived in. Stephen and Vera still took occasional holidays - Stephen was forced to use a wheelchair towards the end - but in the last few years of his life he seldom left London. Stephen died on 16 March 1975. His passing was marked by lengthy obituaries in the Times and the Daily Telegraph. As he had noted sadly in Part of the Wonderful Scene, most of the people he knew had died (he had no children and his contacts with his siblings and their families were limited). Around thirty people attended his memorial service. Vera survived her husband by six years.